Watch how events unfolded during the Boston manhunt for the marathon bombers from the initial blast to the suspects' capture. The search for two brothers accused of carrying out the Boston Marathon bombings evolved rapidly between Thursday night and Friday evening throughout the locked-down city of Boston and its surrounding suburbs. A firefight between police and the suspects early Friday morning left one of the brothers, Tamerlan Tsarnaev, 26, dead. Younger brother Dzhokhar, 19, was captured in Watertown, Mass., on Friday night after an intense manhunt and has been hospitalized. 7 p.m. – Names start pouring into the FBI in response to their release of photos. 10:20 p.m. – Gunshots are heard on the MIT campus. Around 10:30 p.m. – MIT police officer Sean Collier, 26, is found shot in his vehicle. He is taken to Massachusetts General Hospital and pronounced dead. Shortly after the shooting, the suspects allegedly carjack a Mercedes SUV in a separate section of Cambridge. The suspects held the carjacking victim at gunpoint for a half hour before releasing him unharmed at a gas station, according to the Middlesex District Attorney. 11:20 p.m. – Authorities tell the public to stay indoors. Around this time, the suspects try to use a debit card stolen from the man whose car they jacked to withdraw money from three ATMs. The first attempt was unsuccessful, but they allegedly withdrew $800 on the second attempt. At the third ATM, the withdrawal attempt was denied for exceeding the man’s daily limit. Shortly after, police pursue the suspects into Watertown, west of Cambridge, in the carjacked vehicle. The suspects toss explosive devices from the SUV, according to the district attorney, seriously injuring a public transit police officer, Richard Donohue. One of the suspects, Tamerlan Tsarnaev, is critically injured, and later pronounced dead in the early hours of Friday morning. Adam Andrew and Megan Marrer are currently under lockdown in their home in Watertown, Mass., where police engaged in a shootout with the two suspects in the Boston Marathon bombing last night. Friday, April 19, about 1:15 a.m. – A massive police presence, including state troopers and police cruisers with lights and sirens blaring, fill the Boston suburb of Watertown. Several ambulances were also on the scene. 2 a.m. – The FBI releases four new photos of the two men, one in a white hat and one in a black hat, at the Boston Marathon. 2:20 a.m. – The suspects, hiding behind the black Mercedes SUV in Watertown, engage in a shootout with a large number of police officers. The men, about 200 feet apart, exchanged constant gunfire, and the two shooters lit an explosive that lands in the space between themselves and the police, then exploded. One of the two men then ran toward police and was tackled, an eyewitness says. While it is known that one suspect is down in Watertown, it is still not clear at this point whether the shooting at MIT and the firefight in Watertown are related to the Boston Marathon bombings. 4:16 a.m. – Law enforcement sources confirm that the suspect pictured in the black hat is dead, and the suspect in the white hat is at-large and considered armed and dangerous. The officials say the shootings at MIT and in Watertown are directly related to the marathon bombings. MSNBC's Willie Geist, Â Mika Brzezinski and Mike Barnicle talk about the "unprecedented events" which led to the entire city of Boston being placed on lockdown. 4:19 a.m. – Officials in Watertown ask all residents to shelter in place. 4:35 a.m. – Watertown police officers continue to search the neighborhood on foot and in patrol cars. 5:01 a.m. – The suspects have international ties and may have military experience, officials reveal. Tamerlan Tsarnaev, the dead suspect, had an improvised explosive device strapped to him, officials say. 5:20 a.m.-6:30 a.m. – Local universities and colleges including Harvard, Boston University, Emerson College, Boston College, and MIT cancel classes and tell students to remain in place. Boston Public Schools suspended all activities. 5:45 a.m. – Boston cancels all MBTA public transportation service throughout the city. 6:30 a.m. – Amtrak service into and out of Boston South Station is delayed by police activity. Amtrak officials temporarily suspend train service between Boston and Providence, R.I.
7 a.m. – More than 400,000 people shelter in place in the neighborhoods of Cambridge, Newton, Waltham, Brighton, Watertown, and Allston-Brighton. Authorities say the two suspects are brothers. About 7:30 a.m. – The two suspects are identified for the first time publicly. Dzhokhar Tsarnaev, 19, was identified as the suspect in the white hat who was still at large. He was born in Kyrgyzstan. His brother, Tamerlan Tzarnaev, 26, was born in Russia, authorities said. He was the deceased suspect. 8 a.m. – Massachusetts Gov. Deval Patrick urges all residents in Boston and the surrounding area to remain indoors as authorities engage in a “massive manhunt.” Officials extend the shelter-in-place order across the city. About 10 a.m. – Officials identify the deceased MIT police officer publicly for the first time as Sean Collier, 26, of Somerville. A former civilian IT employee of the Somerville Police Department, he had served at MIT since January 2012. 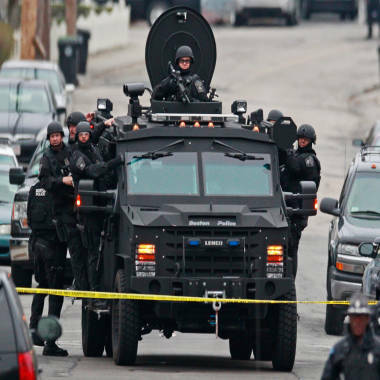 12:30 p.m. – Authorities request that residents remain in their homes, saying that about 60 percent of the area they want to search in Watertown had been covered without an apprehension. A tense night of police activity that left a university officer dead on campus just days after the Boston Marathon bombings amid a hunt for two suspects caused officers to converge on a neighborhood outside Boston, where residents heard gunfire and explosions. 6 p.m. -- Authorities lift the order for people stay in their homes and reopen Boston transit. Gov. Deval Patrick says people must remain vigilant because “there is still a very, very dangerous individual at large.” Col. Timothy Alben of Massachusetts State Police says the suspect has not been apprehended but vows that he will be. 7 p.m. -- A barrage of gunfire is fired in a Watertown neighborhood. 7:35 p.m. -- Authorities say that after resident saw blood leading to a boat in the backyard of a Watertown home and discovered a person hiding inside, they used thermal imaging that showed a person still there. 8:05 p.m. -- Police move in on the boat and believe the suspect is hiding there. 8:45 p.m. -- Suspect Dzhokhar Tsarnaev, 19, is captured alive, police say. Upon hearing that the second suspect has been caught, residents in the neighborhood break out in spontaneous applause as a week of terror concludes. Tsarnaev, bleeding and in serious condition, is taken to Beth Israel Deaconess Medical Center in Boston, according to a Massachusetts State Police spokesman. He will be questioned by a federal team once he is well enough to be interrogated, but under a special legal exception designed to protect public safety, he will not get a Miranda warning or be offered a lawyer for up to 48 hours. NBC News’ Pete Williams, Ron Allen, Tom Winter, Michael Isikoff, Erin McClam, John Bailey, Richard Esposito and Elizabeth Chuck contributed to this report.